St Hugh's was founded in 1886 by Elizabeth Wordsworth, great-niece of the poet William Wordsworth. It was founded as a women's college, and first accepted male students in its centenary year in 1986. 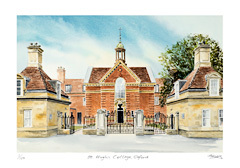 The college began to move to the present site in 1913, when it purchased the lease of a house called 'The Mount' on the corner of St Margaret's Road and Banbury Road. The house was demolished to make way for the Main Building of the college, which was constructed between 1914 and 1916 thanks to a bequest from Clara Evelyn Mordan. The architect was Mr. H. T. Buckland, of Buckland and Haywood in Birmingham.The main entrance of the college leads into the Main Building which accommodates first year students and also houses the chapel and the dining hall. The gardens of the college cover about ten and a half acres.